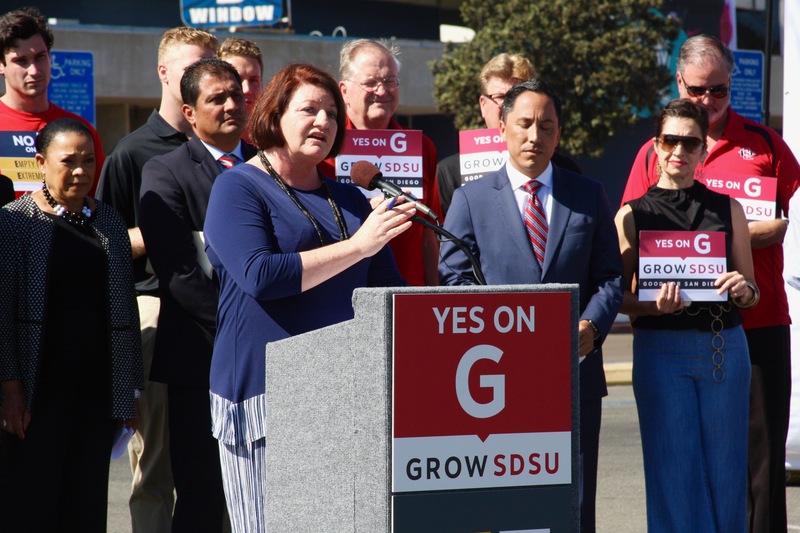 SAN DIEGO (September 19, 2018) – An expansive group of federal, state and local elected officials convened today to announce formal support for Measure G, the SDSU West initiative. Local leaders standing together included Rep. Scott Peters, Rep. Juan Vargas, California Senate President Pro Tempore Toni Atkins, California State Senator Ben Hueso, California State Assemblymember Todd Gloria, San Diego City Council President Myrtle Cole, San Diego City Councilmember Chris Ward and San Diego City Councilmember David Alvarez. The group also voiced their strong opposition to Measure E, the SoccerCity initiative. If approved by the voters this November, Measure G will create the opportunity to transform the Mission Valley stadium site into a vibrant San Diego State University campus expansion that will benefit all San Diegans. The initiative requires San Diego State University to develop a plan for the site that includes academic research space; an expansive River Park; a permanent home for SDSU football that is expandable for other professional spots, including professional soccer and football; and affordable, workforce, student and market rate housing opportunities. A San Diego State University campus expansion in Mission Valley will also fuel the regional economy by bolstering the University’s current annual $5.67 billion local economic impact. Critically, Measure G will provide these benefits while complying fully with the California Environmental Quality Act (CEQA). 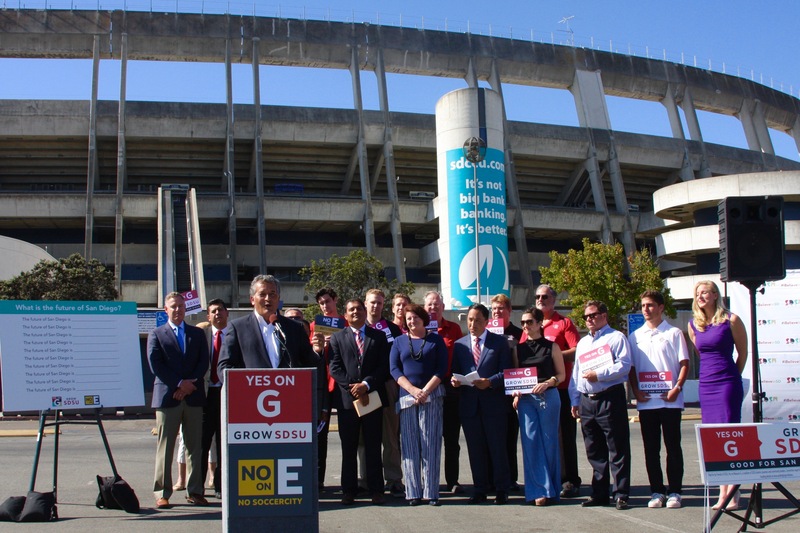 Supporters of Measure G also expressed deep concern with the way Measure E, the SoccerCity initiative, was written. Elected officials noted that Measure E completely bypasses all key provisions of CEQA so that traffic improvements, which should be paid for by the project’s investors, would instead have to be funded by the City and, ultimately, taxpayers. Even further, Measure E sets a bad precedent by developing a critical site through ballot-box planning that completely removes public input and environmental protections. 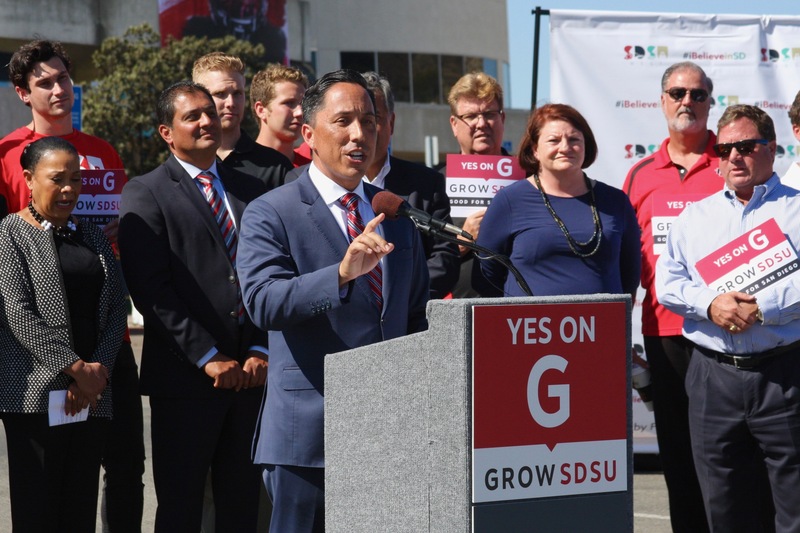 “Ensuring current and future San Diegans have the same great quality of life we enjoy today is a priority for all elected officials, and it’s among the many reasons why I support Measure G and oppose Measure E,” said Rep. Juan Vargas. Measure E opponents also point to harmful implications for San Diego State University’s growth potential should the Measure E succeed in November. The measure provides no legal rights for San Diego State University to expand its campus if FS Investors takes control of the site. Today’s new elected official endorsements join a widespread, bipartisan coalition of support for Measure G and opposition to Measure E. The unprecedented coalition is comprised of the San Diego region’s leading environmental, education, political, business, labor, community and planning organizations. Recent endorsements include San Diego City Councilmember Lorie Zapf and San Diego County Supervisor Greg Cox, as well as the San Diego Regional Chamber of Commerce, Sierra Club, San Diego County Democratic Party, and labor groups across San Diego.